Without a doubt we can definitely say that we saw Tony Romo being a rollercoaster of emotions, a seesaw of moments that range from painful to glorious at the start of the regular season. Although most of the game time was spent with the receivers missing their opportunities, specifically Cole Beasley (unusual), Terrance Williams (normal) and even Dez Bryant (rare), and were strangely determined to drop perfect passes that hit their hands, Tony had 36 completions in 45 attempts, that is 80% effectiveness, amassed over 350 yards and threw three TDs. the other a football that WR Devin Street seemed to have controlled, but thanks to a tremendous blow it got out of hands to land on the defensive. His achievement an example, came without the presence of DeMarco Murray and, at least in much of the game, without Dez Bryant, the two factors which many named as the main reason for the success and # 9 in the 2014 season. After throwing two passes that ended in interceptions and thrashing the spirit of the fans raised a middle of the floor and found Jason Witten in midfield to set the victory TD to give the much needed injection of adrenaline to the fans that he left lying on the floor to be picked up by the excellent performance. 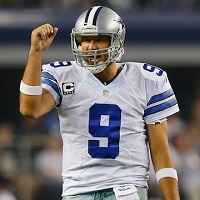 This week, Romo extended his run of games with multiple TDs to 7 – tying the longest of his career – he tied the mark of Drew Brees for most consecutive games with more than 60% of completions with 20, he overcame Joe Montana as the ninth place with more games over 300 yards with 46, he extended to 7 his streak of games with over 100 points in rating, he became the eighth player in league history to throw more than 36 complete passes with 80% effectiveness in one game, and also extended its range as the league leader in victory drives since 2006 with 28.